Let me start with a question of my own. 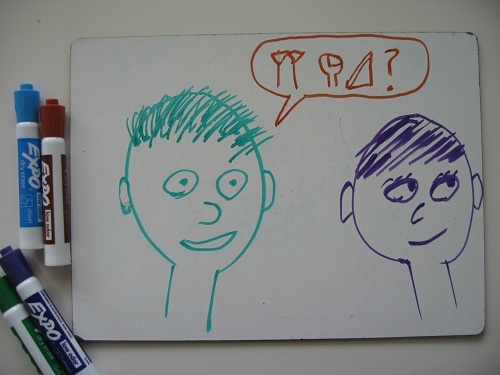 Did you know that you speak Babylonian? You may not think that you do – you can’t ask for directions to a Babylonian bathroom, or order lunch off of a Babylonian menu, or ask a good-looking Babylonian out for coffee. But you’ve inherited Babylon’s legacy nevertheless. You’ve probably noticed that our systems of counting and measuring are largely base 10. There are 10 years in a decade, 10 decades in a century, and 10 centuries in a millennium. But take a look at shorter time lengths: We don’t carve up the day into 10 hours, each 100 minutes long, even though this would make perfect sense. Instead, we divide our time up by multiples of 60 – 60 seconds in a minute, 60 minutes in an hour. Why do we do this? Because our Babylonian uncles used a base 60 number system, and we’ve been following their example ever since. Babylon left another relic in our system of measurements, one that requires a little deeper explanation, and which lies at the heart of your question (yes, I’m getting there): the degree. Angles are everywhere. They form when light bounces off of a mirror, when a bird dives towards the water, when a lamp casts a shadow on a distant wall. 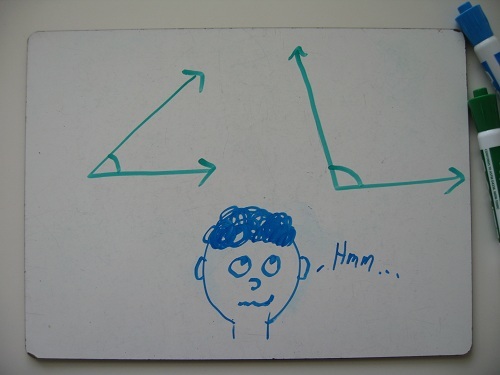 And mathematicians, being the go-getters that they are, need a way to measure angles. But without any numbers, it’s hard to say how much bigger. That’s where angle measurements come in. So, how do we measure angles? Well, the Babylonians had an idea. They decided to cut a circle into 360 pieces, and call one of those pieces a degree. 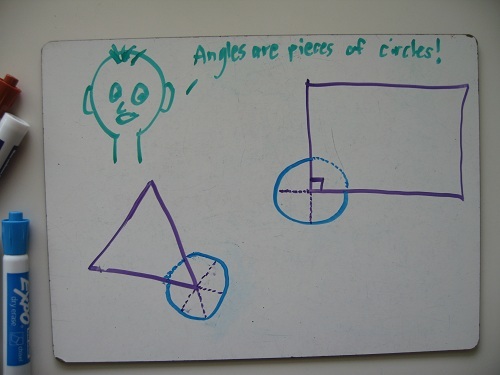 This makes it easy to talk about the size of an angle. Since there are 360 degrees in a whole circle, a right angle will be one-quarter as many degrees – i.e., 90o. Most people learn this system so well, and at such a young age, that it becomes second nature. Skateboarders pull 540o’s, a businessman looking to change plans will call for a 180o, and at one point in our political past, Americans chanted “Fifty-four forty or fight!” to demand that our border with Canada be set at 54o40’ of latitude (where 1’ = 1/60th of a degree). What this familiarity disguises is that the number 360 is totally arbitrary, chosen simply because the Babylonians preferred multiples of 60. 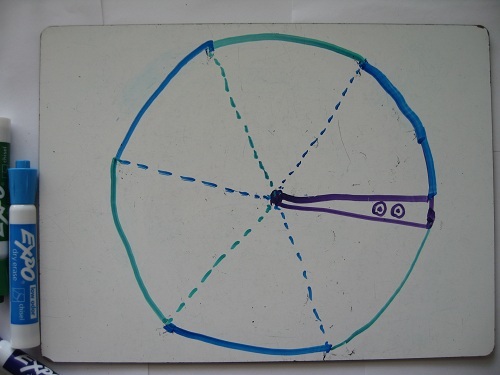 Why not divide the circle into 100 pieces, or 5 pieces, or 400 pieces? (In fact, the 400-piece system does exist – 1/400th of a circle is called a gradian, and it’s that weird mode on your calculator that you never use.) There’s no mathematical reason to pick 360, or any specific number, for that matter. It’s fundamentally just a matter of taste. As it turns out, there’s a better way. But to explore it, we’ve got to lift ourselves out of this rut of thinking. No more dividing the circle into some arbitrary number of units. 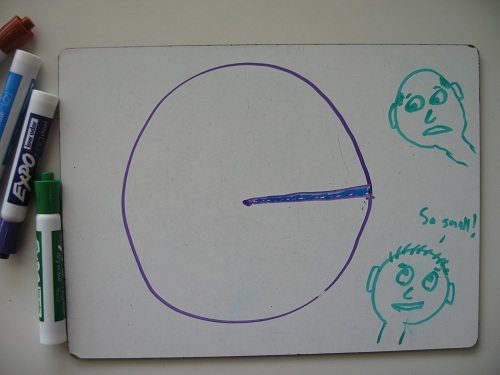 Instead, let’s draw a whole circle, and throw in a radius for good measure. Now, let’s take that radius and wrap it around the outside of the circle. See how it forms an angle? We’ll call that angle 1 radian. 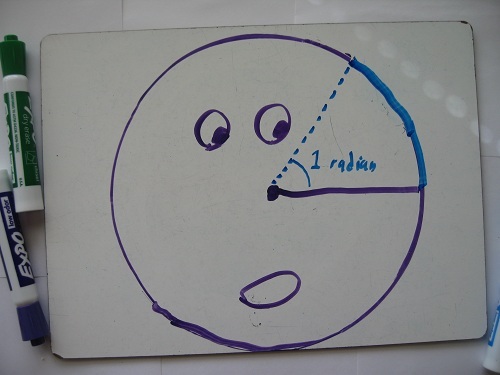 Here’s an angle that’s 2 radians, for comparison. 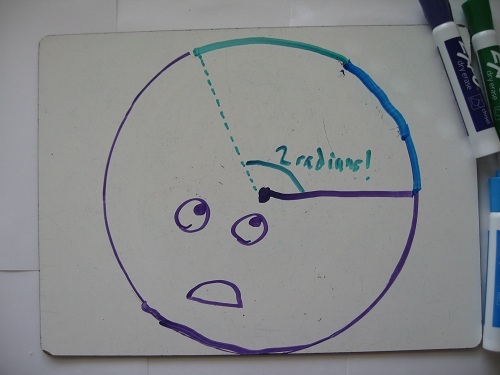 And here’s an angle that’s 3 radians. Notice that it’s almost half a circle (what we used to call 180o), but not quite. Looks like a little more than 6. But how much more? In other words, the circumference is equal to the length of the radius times 2π (where π is roughly 3.14. 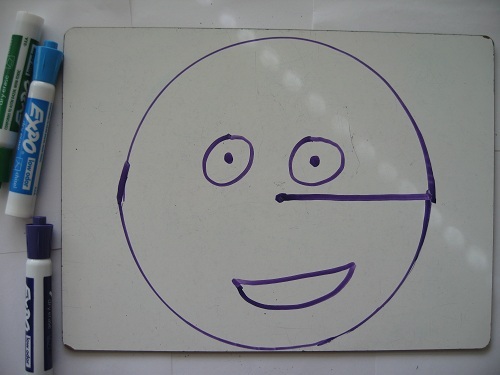 For a better – but still imperfect – approximation, try this). 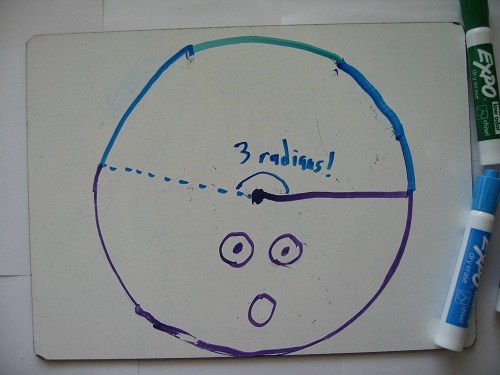 This tells us exactly how many radians there are in a circle: 2π! 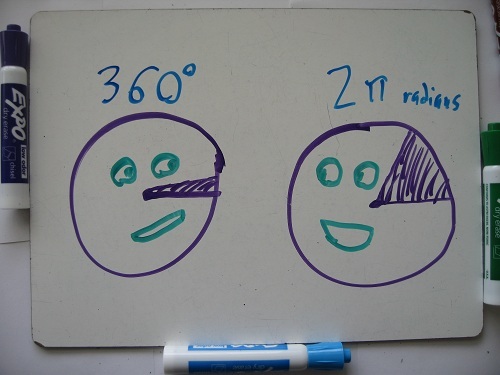 Knowing this, we can now convert between radians and degrees – just as we can convert between miles and kilometers, or Fahrenheit and Celsius. 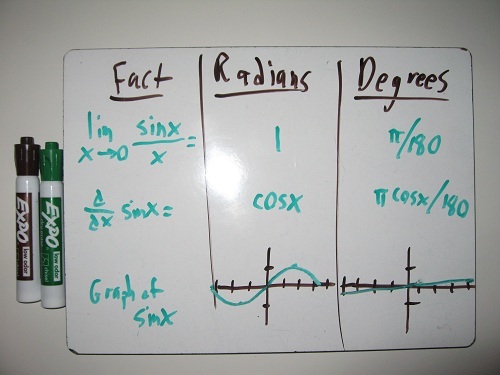 Radians become a perfectly valid, usable measure of angles. But I know you’re not satisfied with that. You’re sharp-witted and wary of being made to learn new things. You want to know: What was wrong with degrees? Arbitrary or not, they let us work with integers ( like 30o) instead of nasty ratios involving irrational numbers (like π/6). Degrees are warm, friendly, familiar. Why ditch them in favor of this bizarre radian? Here’s the best answer I can give you: Degrees are fine for everyday measurements. But Trigonometry marks a turning point in math, when the student lifts his gaze from the everyday towards larger, more distant ideas. You begin exploring basic relationships, deep symmetries, the kinds of patterns that make the universe tick. And to navigate that terrain, you need a notion of angles that’s more natural, more fundamental, than slicing up the circle into an arbitrary number of pieces. The number π, strange though it may seem, lies at the heart of mathematics. The number 360 doesn’t. Clinging to that Babylonian artifact will only distract you and obscure the elegant truths you’re searching for. 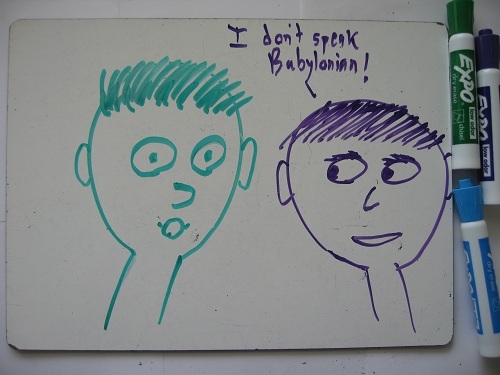 Just like you, I learned to speak Babylonian long before I encountered radians. And for years, Babylonian remained my native tongue – to give an angle in radians first required an act of mental translation. So if you’re resistant towards radians, nostalgic for Babylon, I can sympathize. I hope this helps. When in doubt, remember: 180o = π radians. Next Post What did you get for #9? I got a snake.